I hope you will find plenty to interest you on this website, from great air to air photographs taken in Spain to information on Rhodesia in the 1970s with my photographs plus reports from airshows in the U.K., Canada, Spain and the USA from the 1970s through to the present. There are many miscellaneous features, all on an aeronautical theme and new additions are made on a regular basis. It is worth while looking within the site from time to time to see what is new. To the right is a North American T6 Texan of the Fundacion Infante de Orleans Aircraft Collection and Museum, a wonderful aircraft collection of mostly airworthy aeroplanes based at Aeropuerto de Cuatro Vientos, Madrid, Spain. 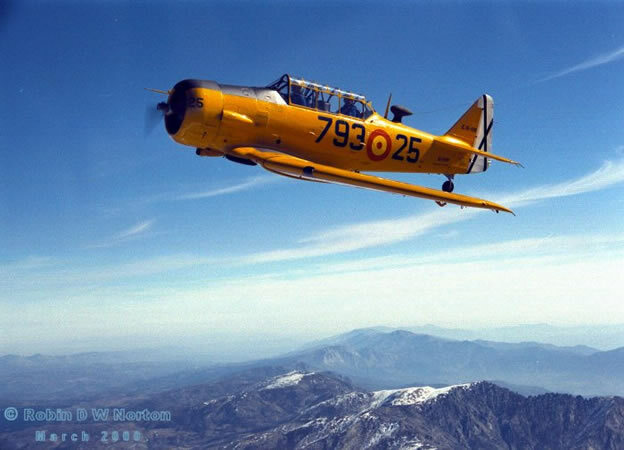 This is most probably my favourite photograph, taken over the Gredos Mountains, West of Madrid on a wonderful day in March 2000 from the back seat of the Museum's other T6. To all my friends within the aviation World, especially in Spain(Espana), my sincere thanks.